Summer is officially here. While your mind may jump to days at the beach, tank tops, and frozen treats, there is something else you’ll want to think about: keeping your home cool. Scorching summer weather may be great – but it can also lead to serious discomfort if your home isn’t kept at the proper temperature. This is where air conditioning comes in handy. It ensures that every room in your home is safe and comfortable. That’s why at Heating Ontario we provide central AC installs for a whole house cool you can rely on…even on the hottest days of summer. Are you constantly spending money on portable fans? Is your old AC unit on the way out? If your home just isn’t cool enough, it may be time to look into your options. Having central AC installed in your home can make a notable difference to the overall comfort level you experience. Imagine walking into a refreshing house after a long day spent outdoors. Or envision being able to sleep comfortably through the night. Both of these scenarios are possible when you choose central air conditioning. 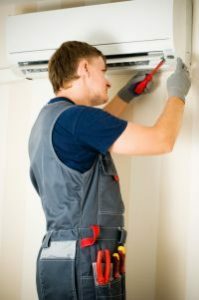 Having central air conditioning installed in your home doesn’t just add to the comfort of you and your family members. It also benefits your health. During the summertime, the risk of experiencing heat stroke is significant. This is especially true for young children and senior citizens. When your home is not kept at the right temperature, this risk increases. Extreme temperatures can lead to fatigue, cramps, dizziness, and even stroke. That is why we focus on delivering quality air conditioning installation to residential and commercial spaces throughout Toronto and the GTA. Since living in a cool and comfortable home is so important, you’ll need to make some important decisions. Like which type of air conditioner will you choose and so on. Does it all feel a little overwhelming? Don’t worry! At Heating Ontario, our experienced cooling contractors know how to make central AC installs for the whole house feel simple and straightforward. We’re there to walk you through your options and answer any and all questions you may have. With our know-how, we can help you make the right choice for your space and your needs. Not sure what size air conditioner your home requires? Want to know the most reliable type? Aren’t sure what make or model will work best for your budget? Our cooling contractors have the information you need. Rely on us to get your home summer ready. The cooling contractor you choose is just as important as your central AC unit. To ensure that your air conditioner is properly installed and will work as efficiently as possible, turn to Heating Ontario. Each member of our staff has the experience and skill needed to get the job done right. Central AC installs can’t be done by just anyone. So, keep your home running smoothly – and your temperature cool and refreshing – by putting your trust in us. Our hands-on experience and reputation in the industry speaks volumes. Why spend the summer months feeling hot and uncomfortable? You deserve better. If you’re thinking about having central AC installed in your home, now is the time to make it happen. A cooler home temperature is just a phone call away! Do you need information about Heating and Cooling services in Toronto, Etobicoke, Markham, Mississauga, Richmond Hill, Scarborough, Thornhill, Vaughan? Contact Us at: 647-591-0537. At Heating & Cooling Toronto we bring quality heating and cooling installation, repairs, maintenance, and inspection directly to your home.